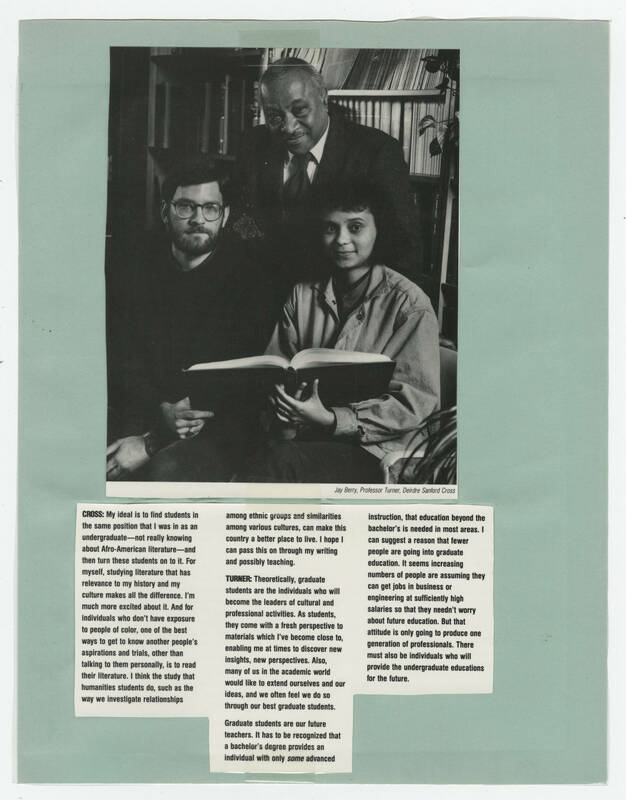 [[Photo caption in italics]] Jay Berry, Professor Turner, Deirdre Sanford Cross[[end photo caption in italics]] [[bold]]CROSS:[[end bold]] My ideal is to find students in the same position that I was in as an undergraduate--not really knowing about Afro-American literature--and then turn these students on to it. For myself, studying literature that has relevance to my history and my culture makes all the difference. I'm much more excited about it. And for individuals who don't have exposure to people of color, one of the best ways to know another people's aspirations and trials, other than talking to them personally, is to read their literature. I think the study that humanities students do, such as the way we investigate relationships among ethnic groups and similarities among various cultures, can make this country a better place to live. I hope I can pass this on through my writing and possibly teaching. [[bold]]TURNER:[[end bold]] Theoretically, graduate students are the individuals who will become the leaders of cultural and professional activities. As students, they come with a fresh perspective to materials which I've become close to, enabling me at times to discover new insights, new perspectives. also, many of us in the academic world would like to extend ourselves and our ideas, and we often feel we do so through our best graduate students. Graduate students are our future teachers. It has to be recognized that a bachelor's degree provides an individual with only [[italics]]some[[end italics]] advanced instruction, that education beyond the bachelor's is needed in most areas. I can suggest a reason that fewer people are going into graduate education. It seems increasing numbers of people are assuming they can get jobs in business or engineering at sufficiently high salaries so that they needn't worry about future education. but that attitude is only going to produce one generation of professionals. There must also be individuals who will provide the undergraduate educations for the future.